We really changed things up this year for Thanksgiving since our daughter Katy and her hubby Esau hosted both families for the big day. They recently moved into their first home and were delighted to have enough room for everyone. They were gracious hosts and we had a lovely time! 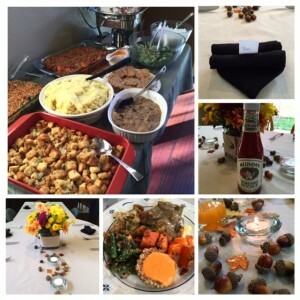 Katy made all of her side dishes plant based/vegan friendly including the family favorite Sweet potato casserole, stuffing, mashed potatoes and Green Bean Casserole. She subbed Earth Balance vegan buttery spread where needed and vegetable broth instead of chicken broth. The gravy was Happy Herbivores Everyday Gravy made with portabella mushrooms.I brought some lovely Cashew Loaf Muffins with a delicious Red Pepper Cheeze Sauce. The recipe is for a loaf but I baked it in a muffin tin for 20-25 minutes. We also enjoyed dessert which I forgot to get a photo of but Katy made the yummy Applesauce Ginger Cake with Maple Glaze. It’s super moist and delicious. We went for a walk in their neighborhood late afternoon before enjoying the dessert. It was a fantastic day! I keep thinking I need to get a post up, but everyday there is so much that needs to be done. We had no idea how busy we would be after hubby Tom retired. Earlier this month I was in Nebraska visiting my parents, brothers and friends. It was wonderful but ten days flew by in a hurry. I encouraged my parents to consider coming to California for Christmas and stay longer to get out of the cold Midwestern weather. They decided to take me up on the offer so we are super excited to have family coming for the upcoming holidays. With the activity level what it is around here these days I don’t know how often I will posting. I find that posting on Instagram and facebook is much easier and quicker and I tend to go that route more often these days. Feel free to follow my Nutmeg Notebook Instagram and facebook page to see what we are eating and what we are doing. Previous Post: « Make Your Own Crispy Tortilla Bowls with No Oil! I hear you on posting Tami but for me, I am working so… plus I have pulled back in general from all social media as you can tell. I love IG but it is very time consuming so I have had to pull back there as well. FB, don’t like doing from the phone so I am on there very little BUT I love your IG photos! With working your free time is even more limited now Jody! Social media can take up way too much time away from living a “real” life! Happy holidays to you! Where are you from in Nebraska? I’m in Lincoln. I know the weather is better in Cali! Hi Penny – my parents also live in Lincoln! I love Nebraska – it’s a beautiful place to live. I must say that I do prefer the weather here in Northern CA – we have seasons but we don’t get snow where I live and I am good with that! It’s so nice to “meet” you! Happy Holidays! Glad you had a nice Thanksgiving, Tami! The food sounds wonderful! Enjoy your parents’ visit! And Happy Holidays! Hi Andrea – you are right we have to focus on living life! I love blogging and have made many friends through the social media sites but it’s way too time consuming to keep it all up all the time! I will post when time allows. So glad you had a nice time with your family over the holidays. My Mom has never been busier since she retired too – we wondered how she fit in a full time job! I am not sure how online you’ve been lately, but I wanted to let you know that my husband Tony passed away last week. It makes me cry just typing those words, but you’ve followed my (our) blog for a long time and wanted to let you know. I am so sorry to hear about Tony Biz. I loved how he teased you and I could sense that you two were deeply in love. This really saddens me and I will keep you in my prayers. Thank you for letting me know. Wishing you all the best in the days ahead.